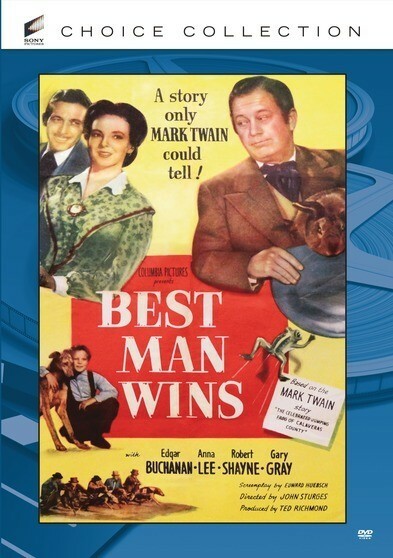 Based on a story by Mark Twain, BEST MAN WINS stars Edgar Buchanan (TVs Petticoat Junction) as Jim Smiley, a man who has never seen a bet that he didn’t like. His latest gambit involves Daniel Webster, a bullfrog who could jump higher than any other and on command. But Jims wagering ways may cost him the love of his wife (Anna Lee, How Green Was My Valley), who may leave him for another man. Newly remastered. Edgar Buchanan; Gary Gray; Robert Shayne; Stanley Andrews; Hobart Cavanaugh; Anna Lee. – 1948 – BW – 74 Minutes. Jim Smiley has a frog that can jump further than anyone else’s frog, and Jim becomes obsessed with entering the frog in all of the local jumping-frog contests, not realizing that his obsession is about to cost him his marriage.